NRA's first tweet since Oregon shooting: "Eddie Eagle" kids' safety program. 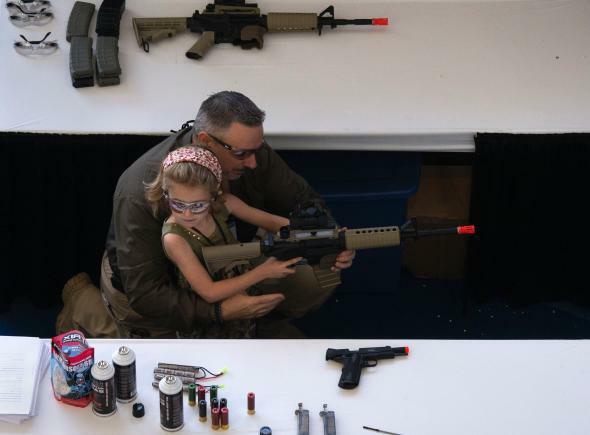 A young girl learns how to hold an airsoft gun during Youth Day at the NRA’s annual meeting in Houston on May 5, 2013. The National Rifle Association’s official Twitter account didn’t post any messaages in the immediate wake of Thursday’s mass shooting in Roseburg, Oregon—a massacre of the sort that happens quite frequently in the United States, which has, by far, more guns in circulation than any other country in the world. See more of Slate’s coverage of the Oregon shooting.